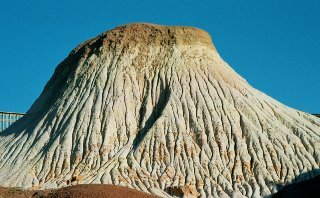 Note: All pictures except those from Southern Australia were taken by my wife Ki m. In SA, Sybille Taylor took some of the pictures used in this article. Although I've always wanted to surf the coastline of Australia, it's a long way from Maryland and isn't the cheapest place to visit. Something changed this year. With a new job, the Olympics in Sydney, a mission from the US Surfing Federation to help promote Olympic recognition for surfing as a sport, and a few friends that I could finally visit with, I decided that had a perfect opportunity to finally take the trip "down under". Old surfing and wrestling buddy ("mate" in Australian) John Geyer met us at the airport. John (talking to me at left) is one of my very first surfing partners from back in the early 1960s, and had probably the most influence on my surfing of anyone I ever met. John still surfs great, wind surfs, and now kite surfs, plus owns SOS (Surfing & Sailing) in Freemantle. He was also my wrestling partner during my college years at Cal-State Long Beach, and although I had corresponded, I hadn't seen him in at least 25 years. Obviously, we planned to do some catching up, surfing and wrestling during my visit. 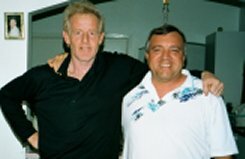 John is the former President of the Windsurfing organization in OZ so would be a key contact for my Olympic recognition activities, plus I was also looking forward to finally meeting is wife Donna and his two children. A good swell was in when we arrived early in the morning a day later. After a little sightseeing and some catch-up sleep, the first place we surfed is a local spot called Cable Station. Cable Station is a man made reef just north of Freemantle. It produces a very nice shaped long right or a shorter but steeper left, even when the swell isn't very strong. I had a little trouble getting down the hill and through the rocks on paddle out, plus there are always a few surfers in the water, but really wanted to test the 4' to 6'+ foot consistent waves. Me on a left at Cable Station. After trying to get a good left to myself, but not being too successful, I finally paddled over to the other side of the main peak where John was surfing. He was ripping a second right peak that produced a long steep ride whenever a bigger wave rolled through. This produced my best rides plus my wife took a tremendous picture of John in the tube. Unfortunately, my legs started cramping seriously after a couple of hours, probably because of the long flight, and I had to go in. This proved to also be a challenge as by then I couldn't walk easily and had to be helped back to the car. Besides some super waves, John also had some excitement that day as a kayaker managed to dislocate his shoulder while we were out and John had to help him get into the beach. Cable Station is a long (for me) paddle out so John got a real workout getting the kayaker back in to shore. Unfortunately, John had some work to take care of at his shop, so he suggested Kim and I drive south towards Margaret River for our outing the next day. Several surf spots were pointed out on a map for us to visit along the way. John also gave me a quick driving lesson to make sure I adjusted to cars that "drive on the wrong side of the road". He really didn't want me taking his new RV on a long trip unprepared, and I was thankful to get some driving help as well. Heading south, the first place we "discovered" was an out of the way break called Florida Beach (shown at right). The swell was still going strong here (4' to 5') and this beach offered both a long left over a rock point at the south end, and a long beach break right at the north end. What really surprised me (and made me a little nervous at first) is that not a single surfer was in the water. We had the entire beach to ourselves with my wife also having her first opportunity to find shells and coral along the shoreline. During our trip she collected three boxes of shells and such, all significantly different than anything we have on East Coast beaches. The next place south we visited, but I didn't surf, is called Border Beach. We were trying to find a road down to the beach and drove into a wooded parking lot on a hill containing several cars with boards on top. The lot overlooked a picturesque cove with a glassy big peak consistently breaking out near the middle. The problem was that the cove was good size, and it was a long walk out to where the break was located. I can see why the place is a great shortboarder spot and also why few longboarders want to carry their boards that far down the beach. We visited a few minutes, but since I didn't relish the long walk either, we drove farther south across the peninsula to a place called Yallingulp. On this side of the peninsula we found the full impact of both the wind and the swell. A slightly windy but solid 6' to 10' left peak was pounding on the first point (at left) with an even larger peak breaking out in the middle of the cove (right). The first point jumped up and broke on a rock reef, which really looked menacing when you looked straight down, while the large peak in the middle was better formed but just too intimidating for me to paddle over. Only one other surfer was out on the point, a longboarder, and it didn't seem that hard getting through the break from just below the overlook. I saw a couple of guys try to get out through the middle of the cove but there was lots of whitewater. It was shallow there and they were able to walk a long way out. However, I never did see them get out to the break and think they ended up washed down the beach someplace. A few days later I ran into a girl surfer who was watching from the beach that day and she told me they were visitors like me but picked the wrong place to go out. Somewhat later in the day we drove into the parking lot above the break at Margaret River. Here was the big surf. The wind was bad and main peak was breaking about 12' to 15' with an outside tow-in break called the Balmy? looking much larger. The break towards the river mouth (at right) looked a little larger then the main break, but way too rough to do anything but maybe windsurf. No one was out at the main break and only a few watchers in the parking lot. I settled for the inside slightly wind protected right just below the cliffs, a smaller wave that only a couple of other surfers were willing to put up with. I didn't surf long as dark was approaching and I'm not that excited about becoming dinner for some darkwater friend. Just a few waves for some pictures before heading into the town of Margaret River. The Margaret River region is one of those places that you want to take lots of pictures of. Located in wine country with lillies growing like weeds along the road, there were a lot of scenic places to see as you drove back into and around the town. The town itself reminds me a little of old downtown Huntington, a real surf town with plenty of down home surf shops and such but not much else. We walked the main road then stopped at a local resturant for a quick bite before checking into the Knights Inn for the evening. Eating places do close early there but the menue was interesting - they offered Roo steaks. Our room was great with an in-room hot tub, much to my wife's enjoyment. I was a little sore from all the long paddles I had been enduring, nothing like the East Coast of the USA, so a long soak in the hot tub was a pleasure for me as well. I really do appreciate the exchange rate between US and Australian dollars. Next morning we were up early and back to the main MR break. It was still big but also still too windy and sloppy for me to surf. Because of the wind direction, we decided to drive north back across the peninsula and find a more protected place that someone of "my advanced age" could handle. A couple of hours north I discovered a real dream spot called Avalon Beach, with another break just north that I can't remember the name of. It was here that I found a perfect 4' to 6' left with only a few locals out. What a great crew to surf with. It took me awhile to figure out what they were saying in the water (I don't understand Australian that well) but we did seem to get along. My wife was taking pictures from the parking lot on the bluff above and managed to meet several of the locals who immediately figured out we weren't from around there. Since they don't see visitors at their break that often, we sort of stood out like sore thumbs. I caught one tremendous long left that took me too close into shore and suddenly I was in the shallow rocks. I had finally discovered why all the locals pulled out of their waves early and didn't ride the inside break. They all thought my crash was great fun but I wasn't convinced. Hopefully one of the many blokes we met will visit my break sometime. After the long left I paddled out for one last wave. When I took off I immediately dropped to the bottom and spun out for a dumping. When I got into the beach I found out that I had left my big fin earlier on the rocks. Fun for the watchers but a pain for me. With my surfing done for the day we said goodby and headed back to John's. Another day and another few waves back in Freemantle. The swell had dropped some and I decided to surf a small beach break wave next to the jetty in Freemantle harbor. It was crowded, but mostly with bodyboarders, and I only surfed a couple of hours usings John's hollow board. 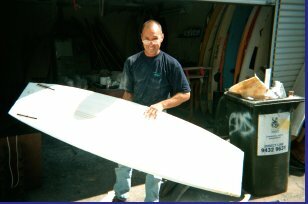 Afterwards, I spent the day at John's shop helping him arrange a new display for his boards, windsurfers, and kite boards. I've known John most of my life and must say I've never seen him strip the glass off an old board before. What a hastle that I remember well from my Wave Trek shop days. Kim and I also took the train into Perth one day to see the sights. This was an interesting visit as the city seems very European when compared to many other places in Australia and the US. We enjoyed the Central Park plus took a shuttle ride around town. My wife stopped at a bowling alley (she bowls a lot) and took a unique picture of a candy bar sign that was being advertised all over town. I actually tried one of these "Finger" bars during our trip. Nothing close to it in the Eastern US. We left Perth after more sight seeing and caught a flight to Adelaide on the next leg of our surfing safari. Adelaide is on the Southern Coast only a couple of hour flight from Perth so we didn't suffer the jetlag that we had from the US to Perth. 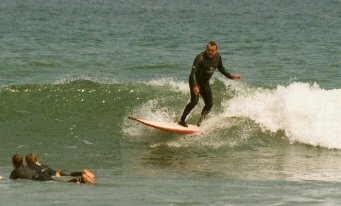 In Adelaide I had a solid week of surfing planned with an old Internet surfing buddy, Ron Taylor and his wife Sybille. They live in a nice little town called Seacliff, about 30 minutes from Adelaide. Seacliff has a clean smaller beach, a pub overlooking the sand about two blocks away from Ron's, and some tremendous sunsets every evening. The next stop when you go out to sea from Seacliff is Antartica. 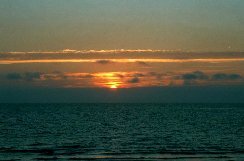 The sun sets nearly straight out to sea at this time of year with many great opportunities for picture taking. Kim and I walked down to watch this sunset several times during our visit. 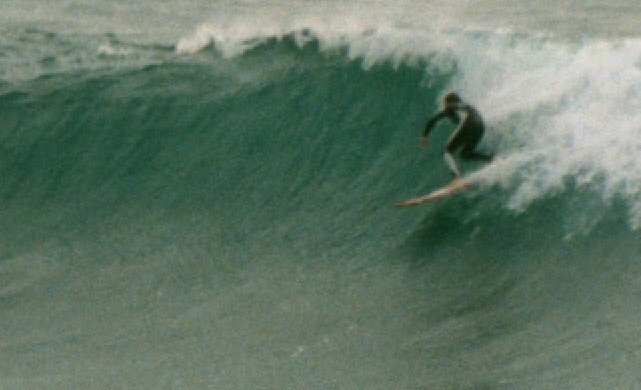 I consider Ron and Sybille diehard surfers from the old school, find a wave, surf until you get too tired to move, go home and sleep, and then when it's light enough start looking for your next surf. Ron is also a Member of SA's Maladjusted Surf Club and is the developer of the Castaway Surfing Home Page, a popular Internet surfing related website for the South Australian locals. 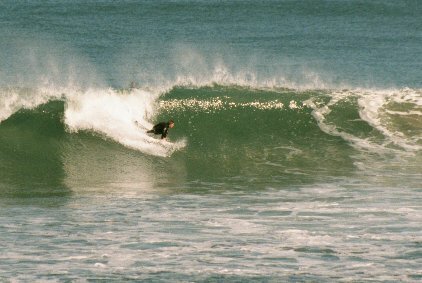 There was a good swell running along the Coastline that seemed to have followed me from Western Australia. The scenery was different, but while the towns looked to me very similar to Southern California, the shoreline certainly didn't. 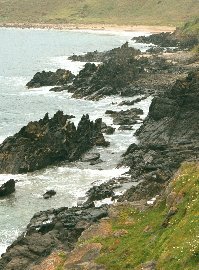 There were many jagged rock formations at the water's edge as well as plenty of high cliff formations along the beaches. Ron took us sightseeing at a local park near his home after we arrived. We were very impressed with both the scenic coastline, and also some of the many other interesting natural features, birds and plants of his area. My wife had a camera spree with all the things to shoot. Finding a good break was easy, deciding which one to actually go out at was a little tougher. The wind wasn't a problem and the waves all had quality (probably the best I found overall). The crowds were there but weren't that aggressive wherever we went. I also found the surfers in the water were very friendly and since I was starting to understand a little of the language by then, I could actually figure out what they were saying. The first break we surfed is located the other side of the bay from Adelaide on the Mid-Coast at a place called Middleton. I believe this is Ron's favorite break since he talks about it on a regular basis. Middleton is a nice little surf town with a perfect donut shop that made me feel right at home. The donuts are not the same as home, but I tried an OZ staple, meat pies, and these made up for the donut shortfall. That surfing is an important part of the town is apparent when you drive in. The sign at the town limit had a carved surfboard on it with a wave base, plus there were murals on the sides of buildings and the local donut shop also had a board museum of sorts outside. The break at Middleton is also supposed to be near perfect, but was a little off during our visit. That day it was a solid 5+ feet with some bigger sets, but the swell was pushing almost straight into the bay and I found the waves both thick and harder to catch with the peaks difficult to judge. I had a little trouble finding a good takeoff spot as the peak seemed to shift right when it reached me and often the wave started to flatten unless I was actually on the peak. The water was a little cooler than Freemantle, plus it didn't take me long to figure out that boots are a must on the many rock bottoms in the area. A quick stop at Southport Surf & Skate solved my boot problem. I really think you would need to surf at Middleton on a regular basis to be able to judge its waves easily. 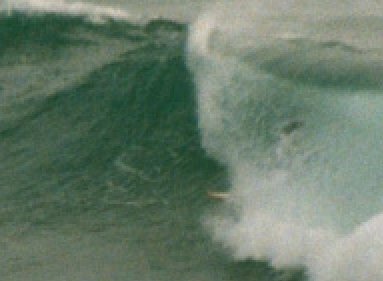 Ron was cranking away wave after wave, seemingly finding the best spot to take off every set. I started to get frustrated after being out for awhile with only a couple of waves, so Ron suggested we head back to one of the closer beaches to his place, a break called Anzec, about a half hour away. What a difference in my surfing! There were lots of easier to catch nice long lefts and rights with only a couple of other surfers in the water. At Anzec we had a solid two hours of 4' to 5' lined up waves without any serious crowds to deal with in the water. Ron got some great rides and only once did we have a party wave with anyone else on the shoulder. I will say that Sybille has a good eye for pictures as she managed to take some of the best surfing pictures during this session that I got the entire trip. 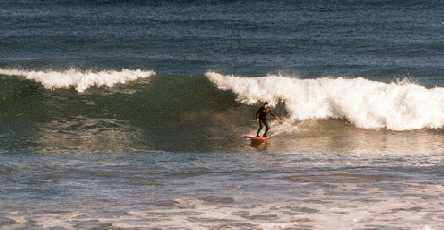 My wife takes great pictures as well but didn't happen to be on the beach shooting enough when I caught my best waves. We surfed a long time and finally ran out of steam. By the time we came in, I was ready for dinner and bed and not much else. First things first though as before heading back we visit Ron and Sybilla's favorite eatery. Ron had said something to the cook about a yankee "Seppo" visiting and the cook really outdid himself on our steaks that night. Next morning it was back to another break close to Anzec called Three Poles. Three Poles was one of the best places I found on the entire trip. It breaks out on a reef with both long rights and lefts rolling well in towards shore. The swell had dropped slightly but plenty of good waves were still rolling through. I did notice that Anzec didn't look like it was breaking outside consistently from where we were sitting. There were quite a few other surfers in the water, but I still caught so many waves that my wife decided to pick up shells and rocks on the beach rather then take many pictures. After awhile Sybille came out and she caught at least one nice left that I saw. On the way back to Ron's we stopped at a local surf shop and looked at some good old pictures of other locals surfing at Three Poles. I think we may have went out again at a very crowded Three Poles the next morning as well, then sight seeing at numerous breaks along the coastline near Adelaide before heading back. One evening we went into the casino in Adelaide and we also visited one of the beach towns nearer to Adelaide from Ron's place. There was also a tragic story all over the news about a surfer being taken by a great white at Cactus Beach. 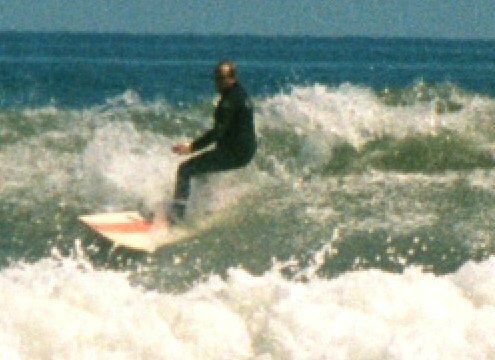 Cactus is several hours from Ron's, but one of the places he likes to surf. I was already getting a little nervous about sharks in the area, so Ron made sure I saw Fox's Point where Rodney Fox was attacked. He also showed me a break where he said a "pointer," the name they call Great Whites, chased him and some other surfers out of the water. It didn't really bother me much staying out of the water anyway that day. We stopped at several places to look at the various breaks while sightseeing. I noticed that in contrast to Western OZ, Southern OZ has smaller coves, but points are still the normal break type with a few sandbar breaks thrown in. As we were driving up the road from one beach break at a park, I spied a large herd (mop) of kangaroos watching us on a hillside. At first no one else saw them then a few moved and we spotted them all over the place. My wife got out the telephoto while I pulled out the movie camera and started shooting. All through Western Australia my wife had bugged me about not seeing a live wild kangaroo, just a couple of road kills. She was actually starting to get on my nerves and I had even went driving in the outback once just to try and find one. We saw and filmed so many that I can now say she is convinced they run wild in Australia. After this we started filming all kinds of parrots in the trees around us, and then had to stop at the Urimbirra Nature Park in Victor Harbor one day to get up close with all the other unusual creatures Australia has in abundance. I do think I would like to have a small kangaroo or maybe a wallabee as a pet. I found out that wallabees are similar looking but not the same as kangaroos. Before we left SA, we had another sightseeing trip into Adelaide itself, this time to Central Park and the many museums and other sights around town. I found Adelaide one of the most picturesque cities we discovered during our trip. The Central Park was a real delight with ponds and plenty of strange (to us) foliage. 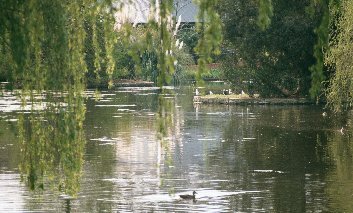 While the park in Perth had several monuments overlooking the city, Adelaide's park is set in the middle of the city with long walkways and plenty of canals. The trees, at least one type, appear capable of protecting a person during a storm. Our next session in the water, the last for me in SA, was back at Middleton. This day the swell had dropped a little, but the waves seemed to me to be lining up a little better. There had been another fatal shark attack, this time farther away then Cactus, and I think it might have bothered the locals making them a little reluctant to go out. 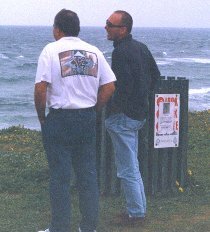 I had met another SA mate, Chris Bowen (left), a member of Ron's Maladjusted Surf Club, and since he was going out I decided what the heck. Nothing seems to bother Chris. Ron did show me how to get out over the rocks though. 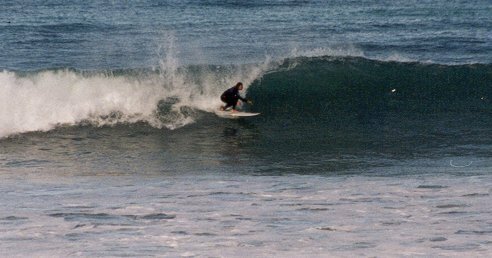 I was using Ron's board but before long Ron was out as well as several other locals. We were reluctant to leave, but next day Kim and I caught another flight, this time to the final leg of our journey, Sydney. The Olympics were in full swing when we arrived but by now I was a certified (or certifiable) Australian wrong side driver so driving our rental from the airport to the Northern Beaches should have been a breeze. The rental place didn't give us good directions though, and after winding our way through town for a good two hours, we finally rolled into Newport. Here we were visiting with another long time surfer and Internet friend, Peter Brown, his wife Eva, and their young daughter Rachael. Pete lives about two blocks from the beach and break at Newport. Since he is self-employed in the computer industry, gets to surf nearly every day. Newport is a nice little beach town which is widely recognized as the home of the Quicksilver surf shop. I had the fortunate opportunity to meet and visit with Nick Carroll while I was there. Nick is closely affiliated with the official Australian organization promoting Olympic recognition for surfing, and I consider this contact very important to my US recognition activities. I first contacted Pete around 1994 when he started his Mountain Man Global Internet Surfing Links Site. 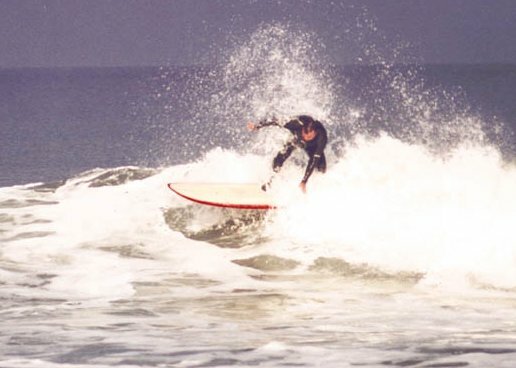 He has one of the earliest and most comprehensive list of surfing sites on the Internet. The break at Newport, as I found at many of the Eastern Australia breaks near Sydney, consists of a sheltered cove with a quality shaped reef break into a sand beach. 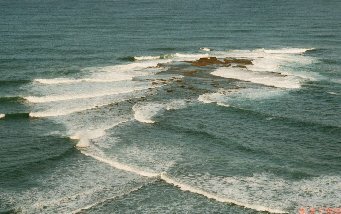 The peak breaks on a shallow reef about 40 yards from the beach, then rolls left and right into the shorebreak. The break slows down just as it gets close to shore giving the surfer time to get out before it produces a pounding shore break. The left to me seemed hollower than the right. 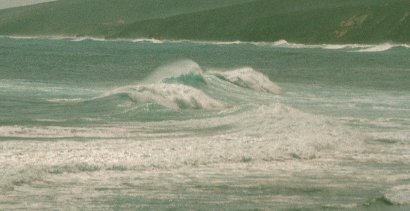 As can be seen in the picture at right, there is also another good size left point break just north of the beach break. The first day Pete showed me his favorite spot at the south end of Newport (below). The wave breaks out on a long point and the waves push along both sides sort of like scissors cutting paper. It wasn't breaking big that day but you could tell the place gets intense when the swell was up. This picture is from up on the cliff above and doesn't really depict the quality of this break. 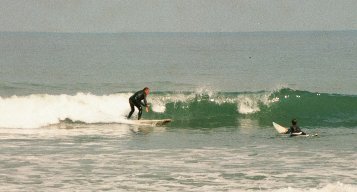 The first day I surfed Newport it was about 6' with a hollow left and right. The wave itself was thick and required the rider to paddle well into the face then get up quick for a steep takeoff. I had some trouble catching waves at first but finally figured out that you just can't stand up too early or you'll fall off the back. All the breaks in this area were crowded. I walked to the break from Pete's house just at dawn and was startled to find a group of 5 other surfers paddling out with me when I arrived. 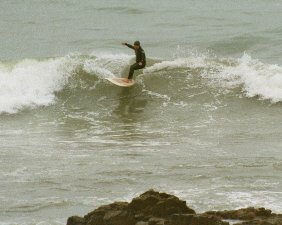 They were mostly short boarders and easily caught most of the waves either inside or on the outside shoulder near me. I was only able to surf two days at Pete's as we wanted to get in several Olympic events during our stay. We left Sydney the day after the Olympics ended. The morning I left, Pete and I checked several good spots finally surfing another break Mona Valle, not far from Newport. This break featured a wind protected peak that sort of rolled around a rock point into a sandy beach cove. The surf was about 4' to 5' with an occasional much larger set wave. It was crowded but this time I managed to get two good waves with no other surfers on the shoulder, and one that my shoulder "buddy" didn't push me off to quickly. Pete went out but wasn't so lucky. We left Pete's for the airport, stopping at Bondi Beach to check out the conditions. I've always been told Bondi was the best spot near Sydney so wanted to see how it was breaking that day. It looked about 4' to 6' with lots of surfers but not many waves that didn't close out. The point wasn't breaking well, just the inside beach areas. What I didn't like is the hugh number of tourists and the bad traffic conditions. I hope the locals really appreciate how nice it should be after all the visitors leave and the city clears the volleyball stadium off their beach. Since our trip out was so physically demanding, we decided this time to stop overnight in LA and spend a day visiting my parents in Huntington Beach before returning to Maryland. Good idea! I awoke October 3rd to morning glass, hollow, 4' to 5' lines just north of the pier. It was a little crowded but the waves rolled in and peeled little tubes all the way from outside, both lefts and rights. After that I really didn't want to go home.